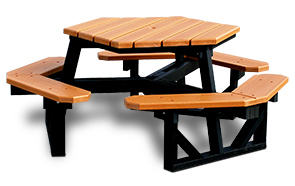 These recycled plastic hexagon picnic tables will make your environment friendly for seating and eating. Made with durable Resinwood slats and a sturdy black recycled plastic base. 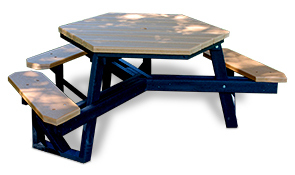 These recycled plastic hexagon picnic tables are available in the Resinwood color options as shown. Optional in-ground and surface mount kits are also available.